On July 20th, a New Mexico court ruled that the state’s school funding system was inadequate and unconstitutional, violating the constitutional equal protection and due process rights of economically disadvantaged students, English Language Learners and Native American students. The ruling is an unmitigated victory for the residents of New Mexico, particularly those from underserved communities. New Mexico students lack adequate instructional materials, curricula and teachers. The lack of resources is having a disproportionately negative impact on children from low-income families, Native American students, and English language learners. To allow at-risk students to overcome the barriers they face, the state must provide programs such as pre-K, summer school, after-school programs, targeted class-size reductions, and research-based reading programs. The state’s teacher evaluation system penalizes teachers for working in high-need schools, creating shortages of effective teachers in high-need schools. North Carolina’s lack of adequate instructional materials, curricula, and teachers is evidenced by the 55 percent reduction in classroom supplies, 39 percent reduction in textbooks, and 2.5 percent reduction in classroom teachers from pre-Recession levels. North Carolina’s disproportionate impact on at-risk students is evidenced by widening achievement gaps on the National Assessment of Student Progress. North Carolina funds fewer Pre-K slots than from before the Recession. Districts have little funding for summer school or after-school programs. The General Assembly’s one-size-fits-all class-size reduction plan is forcing districts to abandon targeted class-size reduction plans that focused on at-risk students. North Carolina’s early-grades literacy efforts have ignored research-informed best practices, and has been associated with declining reading scores. North Carolina has a school-based evaluation system that does a better job measuring students’ family incomes rather than how much learning is taking place, needlessly stigmatizing schools with a high proportion of low-income students. 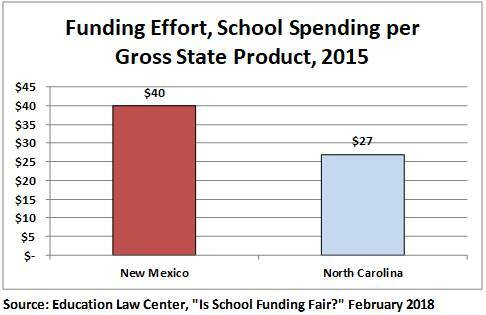 To be fair, North Carolina does a better job than New Mexico in sending a slightly greater share of per-student funding to high-need districts. 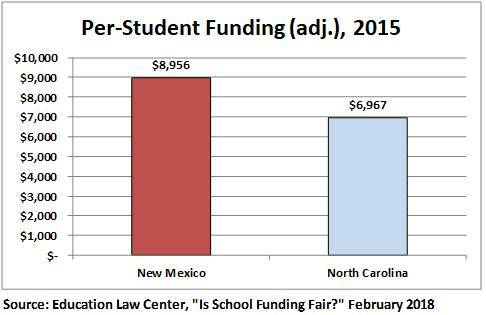 However, this advantage pales in comparison to New Mexico’s substantially higher overall levels of per-student funding. North Carolina’s courts have also weighed in on the state of education in North Carolina via the long-running Leandro case. The plaintiffs and the state have agreed to work with an independent consultant to develop a plan allowing North Carolina to finally meet its constitutional obligation to provide every child the “opportunity to receive a sound basic education.” The consultant’s report – expected sometime in 2019 – will be the first rigorous examination of school funding adequacy in North Carolina history. The report will undoubtedly call for substantial funding increases. Of course, General Assembly leaders don’t need to wait for the Leandro consultant’s report. The New Mexico court order should be all the wake-up call they need to understand how austerity budgets continue to harm North Carolina’s children.